The drama of this distinguished lawyer chastising one of the most powerful men in the United States and silencing his cruelty was one of the defining moments of my life. It spurred a lifelong interest in the Constitution, the Law and the rights of the American People. Today, among other ills, I believe that our American Criminal Justice System is broken. Let me explain why I believe that. Rather than focus on that case, to which those two blogs and subsequent comments provide excellent insight, I would rather look at certain aspects of our legal system today that serve to destroy the notion of a Criminal Justice System that operates fairly towards each citizen and make that system into an instrument of oppression. There is in my opinion so many things wrong about American Criminal Jurisprudence that covering the entire range of “injustice” would require much larger space than this blog post provides. So I would like to touch on what I think are the highlights corrupting this system. The truth is that a person charged with a crime in America today needs the means, or connections to have a good legal team. Wealth is a key decider of ones’ chances in a Criminal Trial and in the case of loss the harshness of the imposed penalty. The prosecution has the advantage of virtually unlimited funds and powers to make the legal battle, a “David and Goliath” situation, without David’s advantage of God on his side. Another component of this is that Prosecutors tend to press cases that they think they can win and also avoid to press charges in cases involving very wealthy and/or powerful people. Prosecutors have the advantage of Media publicity and a public that believes “where there’s smoke there’s fire”. Indigent defendants are at a loss and despite the best efforts of the dedicated people who are Legal Aid Lawyers, the disparity in resources usually lead to defeat, despite exculpatory evidence. We also know that Black and Latino people make up the majority of those convicted and incarcerated in this country as I documented in this guest blog last year: http://jonathanturley.org/2011/11/26/the-incarceration-of-black-men-in-america/ . This unfairness goes beyond just affecting people who would be considered poor. The average middle-class American would be overwhelmed with the cost of mounting a defense to a criminal prosecution. I think that raising bail money alone for charges considered major would be a problem for a majority of Americans and even when found innocent the effects of the charges would take years, if ever, to end. An even-handed Criminal Justice System should give each defendant a fair chance to fight the charges against them. While we have been led to believe that our Criminal Justice System represents the model of even-handed justice, yet this is not the case today in our country. To be considered to be a “fair” trial, a trial should a speedy trial. This is not the case and we see instance after instance of a trial taking many years between arrest, incarceration and verdict. While some might argue that this is caused by lawyers seeking delays, this answer is for the most part specious. Instead, these untoward delays are the result of under funding the court system which results in over crowding its dockets. From the Prosecution’s side, they will often delay trials to gain further evidence for their case. This ignores the idea that in arresting someone, there should be a presupposition that the evidence of guilt has already been obtained. The prosecution extends the length of the accused’s incarceration by making often outrageous bail requests (on “bail able” offenses) that go far beyond a defendant’s ability to pay. This skews the system against those without financial resources and also increases the Prosecution’s chances of getting a plea bargain leading to an admission of guilt and conviction. “Because any person who is accused of violating the criminal law can lose his liberty, and perhaps even his life depending on the offense and prescribed penalty, the Framers of the Constitution took pains to put explicit limits on the awesome powers of government. 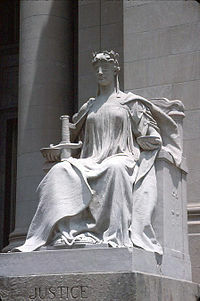 The Bill of Rights explicitly guarantees several safeguards to the accused, including the right to be informed of the charges, the right not to be compelled to incriminate oneself, the right to a speedy and public trial, the right to an impartial jury trial in the state and district where the offense allegedly took place, the right to cross-examine the state’s witnesses, the right to call witnesses on one’s own behalf, and the right to the assistance of counsel. The appointment of Judges in this nation has always been one deeply intertwined with politics and with wealth. Thus often the most important cog in our political system, the person who is to ensure that each case is fairly adjudicated, are many times lacking in the skills and insight to do the job fairly. In those venues where Judges run for their offices, the most important factor is party endorsement. With the need for party endorsement comes the obligation to adhere to “unspoken rules”. In areas where judges are appointed, their appointment is usually beholden to the “powers that be” whether they represent political party, or local wealth. We know factually that there have been powerful efforts by the backers of ultra Conservative movements to have judges put into position that represent their political interests. I don’t believe it is a coincidence that our Constitutional protections have deteriorated severely in the last 50 or so years. While no one can really escape partisan feelings, we should be able to expect that a judge can rise above their own personal beliefs to administer the Law fairly. An expectation it seems to me has fallen far short of its mark in recent years and contributes to the breakdown of our Criminal Justice System. In a system truly interested in justice the position of Prosecutor would be one of impartiality, with their actions based on the evidence and on the Law. Sadly, for most of American history this has not been the case. Many who become prosecutors do so because they understand that they could use their “record” in that office to advance their careers. Their conviction rate and their prosecuting noteworthy trials elevate their public fame. Many of today’s most prominent politicians began their legal careers as prosecutors and used their office to advance themselves. Rudy Giuliani parlayed his headline grabbing antics as a Federal Prosecutor into great wealth and a political career that made him a Presidential candidate. Yet most of the “convictions” that brought him fame and media attention were overturned at the appellate level. His grandstanding, such as the arrest of a young stockbroker accompanied by TV cameras ultimately resulted in the man’s acquittal, yet the impression of Giuliani as a “fighter for justice” remained in the people’s minds. The other problem with the prosecutorial system is that people seeking to advance their public careers, either in politics, or in pursuit of wealth, are reluctant to target people with wealth and power. To build a career one must not make enemies of those people who you might need to call upon for aid and support in the future. I find it interesting that Bernie Madoff, who in essence stole from the rich and powerful is in prison for life, while the CEO’s of large financial institutions are not held liable for the frauds their company has admitted to and the result is that their firms are being fined trifling amounts in restitution for their admitted criminal activity. Despite what some here may believe to the contrary, I have a great deal of respect and empathy towards Law Enforcement Officers. Having worked in a large Municipal Bureaucracy for many years I can truly empathize with people who work for law enforcement bureaucracies, I believe that most people who go into law enforcement start out filled with idealism and the belief that the pursuit of justice is a noble cause. Far too many of those who made that idealistic choice have found themselves corrupted by both their fellow officers and by a politically influenced bureaucracy that robs them of their idealism. The training in many law enforcement agencies reinforces an “us vs. them” mentality, rather than putting emphasis on an officer’s duty to uphold our Constitution and our laws. There is also an undue influence of politics upon Law Enforcement Officer’s that comes down from the higher levels of the bureaucracy they represent. There is lately the increased militarization of LEO’s which leads to the notion that any orders from a “superior” are to be flowed to the letter. There is a further factor, however, that I think leads to corruption of LEO’s. Historically in the United States Law enforcement meant the protection of the propertied class, or of White citizens against the “encroachments” of people of color and or ethnic immigrants. In the south this meant enforcement of “Jim Crow”, but is was not simply a Southern problem. Many city police departments had recruiting drives in Southern States to find officers who had gained experience enforcing “Jim Crow”. The Los Angeles PD and the Detroit PD were famous for this. In NYC the Irish immigrants went from a people disdained, to the position of prominence in a police force “controlling” the Blacks emigrating from the South, the next generation of ethnic immigrants and the Puerto Rican influx. The message disintegrating the ideals of many new police officers was merely the cynicism that arose as they saw what their “real duties” should be. Many, many refused to take part in this cynical view of enforcing the law and kept trying to fairly perform their duties, for some like Frank Serpico this almost led to his death as he was shot by a fellow officer to coverup a police run drug trafficking operation. A third factor is that those officers who rise to the ranks of Detective and are thus the ones charged with investigating crime, are promoted into a dysfunctional system where expediency takes precedence over justice. Too often they are overloaded with “caseloads” that demand quick turnover, or they’ll see their career advancement possibilities diminished. The detective soon learns that their superiors are more interested in “clearing” cases, rather than pursuing justice. This leads even the best of detectives to have a narrow focus on who they suspect and pursue that doggedly even though other evidence might present itself. While most people with some knowledge of our Criminal Justice System understand its purposes and its flaws, the general public is for the most part ignorant of the issues. While I’ve heard some elitists blame this on the level of intelligence of the general public, I don’t agree that most people lack the intelligence to understand what is at stake in our Criminal Justice System. I believe that much of the problem of the public’s lack of knowledge is twofold. The first is that our public schools no longer spend the years of school teaching the nature of our Constitution and how our government works. My own education through high School was in public schools until graduation in the early 60’s. By the time I graduated I had a pretty complex understanding of our Constitution, of our governmental structures and of our legal system. I know though from the education of my daughters (they went to excellent public schools) that what had been so much a part of my own Civics (Social Studies) curriculum had been simplified to the point of becoming incomprehensible. The more detailed views of our Constitution and our legal system have been left to the collegiate level and unfortunately by then pre-judgments and lack of understanding a citizen’s constitutional protections have already become relatively entrenched and misconstrued. The second basis of public ignorance of the criminal justice system comes from propaganda that sometimes is purposeful and sometimes is inadvertent. Almost 50% of our television shows are police procedurals, of various forms, which show crimes being solved and justice being handed out in the convenience of one hour, less commercial time. The portrayal is overly simplistic and creates a “good guy police/bad guy criminal” counterpoint. The overt propaganda we see on TV can be seen in the news conferences and press releases of police and prosecutors. Despite what jurors might swear to the judge, the majority of them are aware of the negative publicity regarding the defendant and have had “evidence” leaked to them via TV. By the time a defendant comes to trial in a well-publicized case many possible jurors have already made up their minds and their mindset is rigid. With these factors interacting with the views of the public, is there any cause to wonder that so much has been done to destroy our Constitutional safeguards, without widespread public protest? These are my views of our Criminal Justice System today and to me it is “broken”. As I began this post detailing how the “McCarthy Years” shaped my outlook on criminal justice, it was done as an admission that my views today may be colored by my epiphanies back then, Since most readers of this blog are my juniors in years, without that direct experience/ remembrance of the “Cold War” excesses, perhaps you see it differently. Please express you own opinions and whether or not you see this with the same urgent mindset that I have? Also what do you think I have missed in addressing this problem? Listen in as Pittsburgh Attorney Frank Walker and DJ Scottro talk about the dangers of Public Urination Charges. Thank you for this insightful article. I believe that the biggest issue with our justice system is the public’s perception of its realities. Innocent until proven guilty? No, that’s not the reality. The reality is, in fact, the opposite, and the burden of proof falls to the defendant, especially if the defendant is poor. Everyone breathes a sigh of relief when someone is arrested for a crime – well, thank goodness THAT’S solved, and they got them off the streets. The truth is, few cases are clear-cut, caught-red-handed cases. People are incredulous that someone is incarcerated for 20 years for crimes they did not commit, but that’s not a few isolated incidents. False confessions, plea bargains…people don’t confess or plea when they’re innocent, right? Wrong. Face five charges that could amount to 50 years in prison (or life), or plea down to one or two charges, and possibly get out someday. Juries are comprised of humans, who are emotional, biased and frightened. Juries convict people all the time on circumstantial evidence. The truth is, the higher the crime conviction rate of a judge or other political figure, the more the public should be frightened of them. The other half of the equation is missing–they should be just as concerned about the public figure’s track record of proving innocence. Thank you for your cogent comment, which I agree with in its entirety. This is an important essay, and I wish it had had the benefit of an editor. As it is, it is so poorly written that I was repeatedly distracted and finally gave up on reading the rest. Thanks again. There is so much material illustrating the breakdown of America’s criminal justice system that the wonder is that people don’t universally accept it as proven. Although we must rely on whatever remainder of equitable treatment still exists, the reality of equity has departed so far from the theory that it calls everything about the system into question. “Ms. White could face questions from Wall Street critics in Congress over her defense of Kenneth Lewis, Bank of America Corp.’s BAC +1.17% former chief executive, in a civil-fraud case. http://www.salon.com/2013/01/24/secs_new_wall_street_enabler/ Oh well, David Sirota says White is an enabler of Wall st.
SAN FRANCISCO (MarketWatch) — Sorry, Sallie. After weeks of vetting, courting and grappling, it appears that President Obama finally found his top cop for Wall Street. And no, it wasn’t someone who can easily be identified with the industry — unless you consider organized crime and terrorism branches of modern finance. There will be no Sallie Krawcheck, the former brokerage chief at Citigroup Inc. and Bank of America Corp. . It won’t be Mary Miller, the official in a Treasury Department considered cozy with bank interests. It wont be the internal candidate, enforcement chief Robert Khuzami — who has surprised Securities and Exchange Commission critics by tackling the chronic insider-trading problem. Read full story on Mary Jo White’s nomination. President Obama, perhaps trying to assuage critics who argue he’s been to lenient on the Street, will nominate Mary Jo White, a former prosecutor. You think Steve Cohen is intimidating? White took on mob boss John Gotti and al Qaeda. White’s reputation and career is a stark contrast to predecessor Mary Schapiro, a career bureaucrat who was viewed generously as a pragmatist. The critical view was that she may have been decent manager, but as a leader was ineffective and too easily pushed around — as her losing fight to regulate money market funds this summer revealed. White won’t be and shouldn’t be taken lightly. A 2002 interview with PBS revealed White to have an excellent relationship with the Federal Bureau of Investigation. And she spoke in terms of getting bad guys, not working with them: “We know who to look for, how they operated, where they operated,” she said of the terrorists. Read transcript of White’s interview on terrorism. In some ways, her task taking on the bad guys of finance will be tougher. Unlike gangsters and terrorists, insider traders and fraudsters will argue that they’re doing things the American way — through their high-priced attorneys. Big institutions will lobby against her dictums the way Fidelity Investments did this summer. But you can bet the public and investors will be better served by White than Krawcheck. ap, That public defender situation is terrible. You cannot imagine what it is like in Texas. I once worked for a state legislator that was a public defender. He had a great sense of social justice. I’d always wanted to be a lawyer, but unlike Travis Williams — the subject of this Op-Doc video — I never wanted to be a public defender. I didn’t understand how anyone could represent people who did terrible things. “Criminals” were not people I wanted to help. Then, in 2009, while working in the legal department at A&E Television, I met Jonathan Rapping, the founder of what’s now Gideon’s Promise. He invited me to his client-centered legal training program in Alabama. At the start of training, Mr. Rapping asked each lawyer to articulate why he or she chose to become a public defender. One young man said he had a brother with Down syndrome, so he wanted to help people who could not navigate the legal system for themselves. Another said he had been arrested as a teenager, so he wanted to help kids like him who didn’t know their rights. Their stories moved me. I learned more about the true state of the criminal justice system during that week than I knew from all my years practicing law. I wanted other people to learn about what they were doing and so I decided to make this film. I was horrified by what I learned about the criminal justice system. Innocent people, in prison for months or years, sometimes plead guilty to get out of jail; onerous sentences are too often given for minor crimes; people can lose civil rights, like the right to vote, as a result of criminal convictions. In America, a felony conviction can be a lifelong sentence because of this multitude of collateral consequences. I also saw what a difference it made to have lawyers like Travis fighting hard for poor people’s rights. I saw him tell clients and their families that they were facing long sentences, outrageous bail terms or prison. But I saw him deliver even the worst news with compassion, and I saw him fight for every client. He’s inspired me to judge less and listen more, to try to put myself in the position of people who face a terribly structured system that often provides justice to neither the victim nor the accused. Thanks to Travis and the other young lawyers I met on this journey, I can proudly say I’m a “true believer” in their cause. This video is part of a series produced by independent filmmakers who have received major support from the Ford Foundation and additional support from the nonprofit Sundance Institute. Dawn Porter directed and produced “Gideon’s Army” a feature documentary that is premiering at the 2013 Sundance Film Festival and will be broadcast later this year on HBO. She is a graduate of Swarthmore College and the Georgetown University Law Center.